Nigeria’s city, Lagos has failed to make it onto a top ten list of the world’s most liveable cities, instead occupying second slot on the least liveable list, according to a ranking of 140 cities by the Economist Intelligence Unit (EIU), a member of The London-based Economist Group. The commercial capital of Nigeria, Africa’s largest economy by gross domestic products, missed out on the Economist Intelligence Unit’s 2017 prestigious top ten ranking on poor scores in healthcare, education, culture and environment, and infrastructure. Lagos scored a lowly 36 percent, just a head better than Syria’s Damascus, which occupied the bottom position with 30.2 percent. Possible factors that scored Lagos low are the city’s high population density, poor infrastructure, traffic congestion, carbon emissions and poor drainage. Only this year the state experienced one of its worst flooding in recent years with highbrow areas such as Ikoyi, Victoria and the Lekki corridor submerged in water following heavy rainfall. 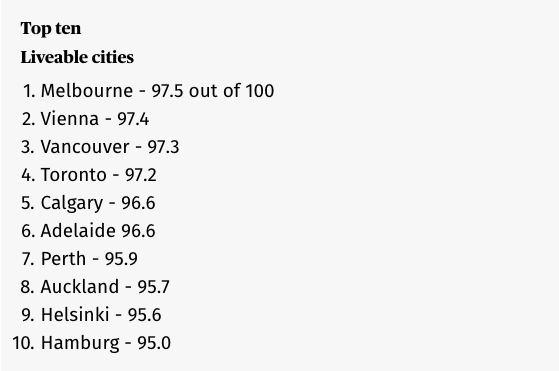 For the seventh consecutive year, Melbourne got the top spot with a score of 97.5 out of 100, and Vienna came in a close second with 97.4. Three Canadian cities made it into the top five: Vancouver, Toronto, and Calgary, with 97.3, 97.2 and 96.6 points respectively. 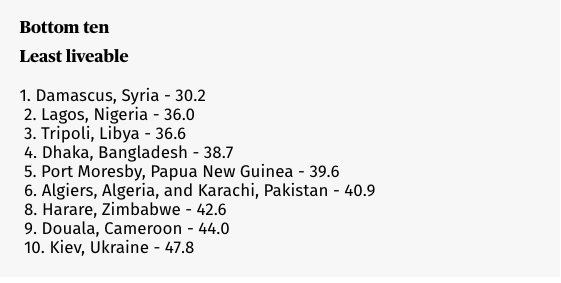 London came 53rd in the list of cities. The top ten, which remained unchanged from last year, also included Adelaide, Perth, Auckland, Helsinki and Hamburg. The report explained that global business centres tend to be victims of their own success. “The ‘big city buzz’ that they enjoy can overstretch infrastructure and cause higher crime rates,” it said, adding that New York, London, Paris and Tokyo, which are all prestigious hubs with a wealth of recreational activities, suffer from higher levels of crime, congestion and public transport problems than are deemed comfortable. On the other hand, mid-sized cities in wealthy countries tend to do well in the rankings, since lower population density means infrastructure that is under less strain, often making for better quality of life. It cited Melbourne as having a population density of 453 people per square kilometre, which compares with Lagos’ more than 18,100 and London’s 5,200. “The question is how much wages, the cost of living and personal taste for a location can offset livability factors.